If you are ever in Midland, Ontario, be sure to pop into Ciboulette et Cie for a sandwich. I had always heard about their sandwiches but hadn't tried one until last week and I'm so glad I did. Now if I was better at this foodie thing, I would have remembered to write down what I got on my sandwich, but I'm pretty sure this is close to accurate: sliced chicken, avocado, field greens, smoked cheese, olive tapenade, and mayo on a white ciabatta bun. The combination of flavours tasted amazing and avocado on a sandwich is simply one of the best things ever. 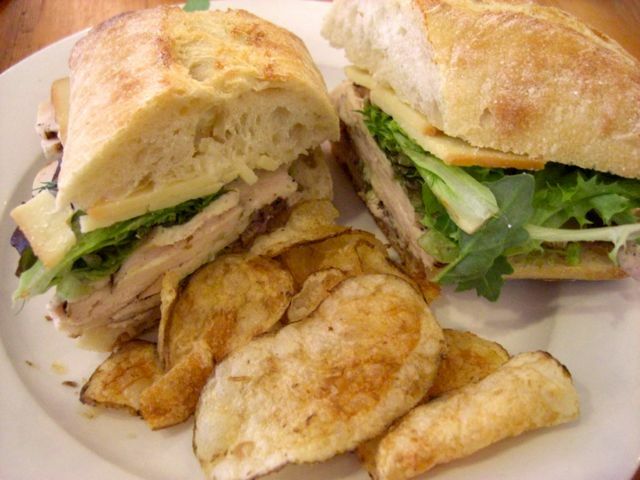 Sandwiches are served with a side of kettle cooked chips which made for a very delicious lunch. I've had to knock out my chip/crisp eating because of the salt. So lately, I've been using baby organic beets, slicing them thin, and eating them with my meals. So flipping good. That bread looks pretty darn good as well. Wow - glad you are enjoying your beets. I am cutting out chips as well, and sometimes eat dill pickle slices to get that crunch I'm looking for. Lots of salt, though. That bread on the sandwich is great. Best sandwich I've had in a long while.